Help for junior riders by Darwin-based (NT, Australia) riding instructor, Heather Bryce. It’s no fun having to kick your pony to get him moving- it’s tiring on your legs, you feel bad for drumming on your bud’s sides, and you can’t ride accurate transitions. Here’s a schooling solution to a very common problem. Start at a halt, check your position, and make sure your legs are wrapped around your pony, ‘giving him a cuddle,’ not squeezing, just resting on his sides. This means when you do apply a leg aid he’s not surprised by it, and also, you don’t have to move your legs to reach your horse. Give a soft squeeze, even if it usually takes an almighty thump to wake you pal up. Chances are, a lazy pony won’t budge! If he doesn’t respond to your calves, use a crop or dressage whip just behind your leg, with a quick tapping motion. Then, straight after, give another squeeze. Your pony should walk on, and you should reward him! Give him a big pat, and let him know that he’s just done what you wanted. Then bring him back to a halt, and try it again. If he’s a very clever pony he may have learned quickly, and might walk on straight away, from just a small squeeze. If not, you’ll need to tap him with your whip again. Always make sure you follow up your whip aid with a soft squeeze of your leg. This way, the pony knows that he must go forward from a leg aid, not just from the whip. Always reward your buddy when he does as he’s told, and remember to only use the whip as a back up to your leg aid. Once your pony can go from a halt to a walk from a soft leg aid, you will be amazed at how quickly he learns to go from walk to trot, and also from trot to canter. Follow this chart to make sure you are using the whip appropriately. Soft leg aid -------> goes forward..... big pat! give another soft squeeze. -------> goes forward..... big pat! Everyone in the lesson strikes off on the inside foreleg, except your pony. You love him heaps but it usually takes you three or four tries to get him on the correct lead, if you ever manage it. So, what do you do about it? Here’s some exercises and tips to get over the wrong-leg-blues! When a horse canters, the inside hind leg comes right up under the body, to push forwards. That’s part of the reason cantering is so comfortable. The inside foreleg is the one that should be leading, and it needs to stretch out further than the other foreleg. A lot of riders lean inwards when asking for a canter transition, but this puts the weight of the over the legs which need to move most! By shifting your weight to the outside of the saddle, and pushing down a little extra in your outside stirrup, you can do the opposite and put your weight on the outside of the pony. This will encourage him to lift into canter on the correct leg, because his inside hind-leg is free to move easily! Make sure you sit centrally in the saddle when you’ve got that transition though, as leaning out might become a bad habit, nearly as bad as leaning in too much! 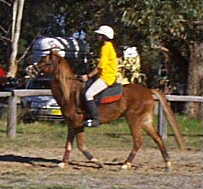 Sometimes ponies get in the habit of cantering on the wrong leg on one rein, and no matter how many times their rider comes back to trot and tries again, the pony just won’t go on the right leg. If you find yourself in this situation, here’s something to try. First, establish a nice steady, and fairly quick trotting rhythm. Work on a circle, asking for bend around your inside leg. Then slip your outside leg back, and push his hindquarters over a little, just enough so that you can feel a little twist in his spine, underneath you. You can try this in walk on a circle to start off with if you are unsure. Then, out of a corner going down the long side of the arena, or in an open field, push his hindquarters over like you did on the circle, and give him a firm nudge with both legs, remembering not to lean inwards. It might help to give a little click with your tongue or say “up.” This exercise encourages the pony’s inside hind leg to be pushed out from under his body, making it easier for him to go on the correct leg. Stopping or slowing down can sometimes be a problem, especially for strong ponies, or ponies with hard mouths. Sometimes your pony just doesn’t want to stop, and it doesn’t matter what you say or do! Here’s some things you can do to improve your downward transitions. First, just like a boy scout, be prepared! Sometimes all you need to do is get your pony’s attention, and he’ll listen to your aids for a downward transition. Try a squeeze-and-release motion on the outside rein, a deepening of your seat, or a little nudge with your legs. Watch your pony’s ears, if they flick back, it means he’s listening to you and is ready to obey you. Rather than giving one long pull on the pony’s mouth, it is kinder, and also more effective to give several little squeezes to the reins, like you were squeezing a sponge. A pony that opens its mouth or shakes its head when rein pressure is applied should have his teeth checked as he may be in pain in his mouth. Sometimes, to get more strength in their arms, riders stand in their stirrups a little to pull their pony into a downward transition. Not only is this not very nice for the pony’s mouth, it also puts the rider in a poor position. Instead, soften your back, and take a long breath out, to concentrate your weight downwards. Stretch your heels down, as this deepens your seat, and hunch your shoulders a tiny bit to push yourself down into the saddle more. A squeeze on the reins and a little voice command like “woah” or “halt” usually does the trick! Walk on at a nice steady walk. Don’t let him dawdle, but also don’t rush him along. Keep your hands soft and follow the movement of his head with your hands. Start on a large circle, about 20m diameter. Your inside leg should be squeezing on the girth to ask him to bend his body. Your outside leg should slip back behind the girth a little and rest there gently, not squeezing, to stop your pony from swinging his hind-quarters out. Now, squeeze quite hard with your outside leg to ask him to turn, at the same time, use your inside leg at the girth to keep asking for bend. Squeeze your inside rein to ask your pony to turn on to a small circle, only about 6 metres across. Make sure you don’t push your outside hand forward, you aren’t riding a bicycle! This simple little exercise is known as a “volté” in dressage circles (pun!). Once you have ridden the volté, return to the larger circle again. You can vary the exercise by making the big circle in trot, performing a downward transition to walk, and then doing the volté. You should trot on again when you reach the 20m circle again. Make sure you change the rein and work both sides of the horse. It’s also nice to start off slowly on his ‘bad side,’ which is often the left.